No paste has been used in the creation of these collages. The originals are only files on my computer. Hence, they are available only as prints and cards. Available in print in either of two sizes, 8"x10" print, matted to fit in an 11" x 14" frame for $35, or 13" x 19" print matted to fit in an 18"x 24" frame for $45. Cards are also available in sets of 4 (identical) for $12. 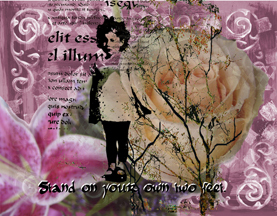 Scroll down to see larger images and descriptions of these digital collages. "Harsh judgments about body acceptability create a nation of hunched over tall women, short women on stilts, women of size dressed as though in mourning, very slender women trying to puff themselves out like adders, and various other women in hiding." 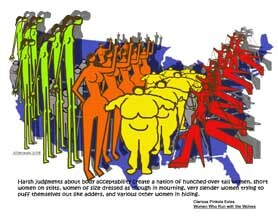 Superimposed over a US map are cartoonish women I've drawn-- tall, skinny, short, fat, and some in hiding. In our quest for perfection, we have forgotten to nurture our "inner beauty." "Put on the loose chemise, tie the ribbons in your hair, at your waist, or on your ankles and tell the body to take it from there. Dance." 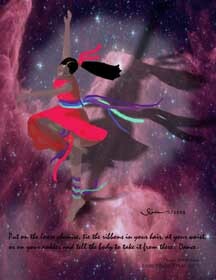 This collage uses photographs of the cosmos and drawing to illustrate the quote. Matted, it is ready for an 11"x14" frame. "If a woman . 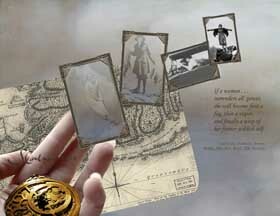 . . surrenders all power, she will become first a fog, then a vapor, and finally a wisp of her former wildish self." It was fun sorting through old family photographs to find examples of my grandmother being her wildish self, a fog, a vapor and then, a wisp. 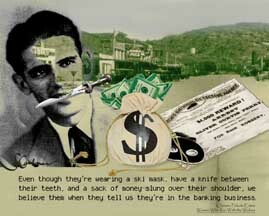 "Even though they're wearing a ski mask, have a knife between their teeth, and a sack of money slung over their shoulder, we believe them when they tell us they're in the banking business." 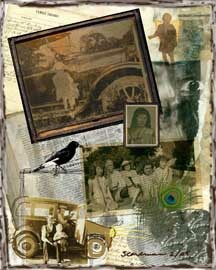 This collage started with a photograph of the main street of Mangum, OK, taken by a relative in the 1930s. The "banker" is my uncle Aaron. "The vehicles through and by which women reach home are many: music, art, forest, ocean fume, sunrise, solitude. These take us home to a nutritive inner world that has ideas, order, and sustenance all of its own." 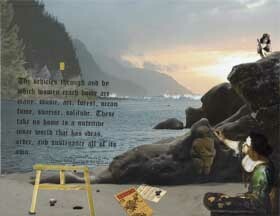 The quote for this collage is the canvas on the easel that is indistinguishable from the landscape. The rocks are from a photograph I took on the beach in San Clemente, CA. The artist is from Gentileschi's Allegoria. "Certain hurts, and harms and shames can never be done being grieved: the loss of a child through death or relinquishment being one of the most, if not the most enduring." Having experienced the loss of a child, I know this is a true saying. 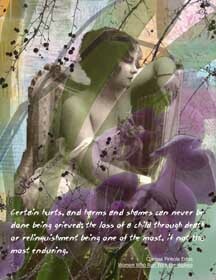 This collage uses a copyright-free image of a pensive, if not sad, woman. The background is composed of a stamped and painted paper I made, as well as a photo I took of one of our orchids in bloom. "Have you ever wondered how you managed to end up in such an odd family as yours?" Is there anyone who hasn't at one time or another wondered about that? 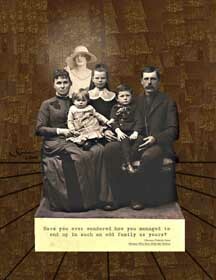 Photoshop helped me "adopt" a very elegant lady with an aura and an attitude into this unassuming family. 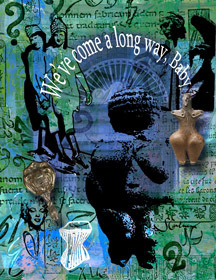 This digital collage is made from photos I turned into stamps, images of several prehistoric fertility goddesses, including the Venus of Willendorf, and an image of Marilyn Monroe. 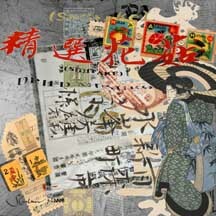 The background combines rubber stamping with painting and photos. When I visited the neighborhood Asian grocery store to buy shitaki mushrooms, I had no idea that I was getting collage material, too. The bag that the mushrooms came in had some beautiful Chinese script and a lacy background. I made a scan of an authentic Chinese cookbook I own (the recipes are given in English and Chinese) and added other oriental ephemera I had to complete this composition. This collage uses a baby picture of my sister. Her face is so sweet and looks a tiny bit frightened. I altered the photo to resemble a rubber stamp and used her whole body as a shadowy image inside her head. I originally made a collage similar to this for my sister for her birthday. Was she pleased? Well, no. She asked if I were suggesting that she needed to stand on her own two feet! It wasn't that at all. I simply thought the image of her three year old self standing there looking scared, or at least a little unsure of herself, was perfect for the "Stand on your own two feet" admonition. The beauty of working digitally is that it is so easy to change things up! 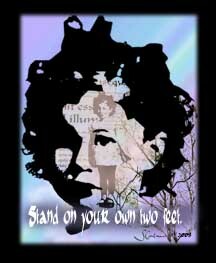 After the conversation with my sister, I changed the layer with the lettering, and then sent her a revised version that reads, "Standing on her own two feet." This is another version of the picture of my sister. The background here is a paper I stamped and painted, plus two flower photographs I made. I like the way the rose petals become the fabric of her dress. Where, O Where Has My Little Girl Gone? 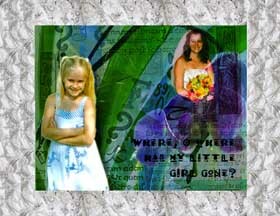 In this collage I used pictures of my daughter as a 6 year old and as a bride. Another picture of our orchids is layered with a stamped piece I did to form the background. I used pictures of the beading from the wedding gown as a frame around the collage. Unlike the majority of my work, this collage has no words. There are pictures of my mother from age 2 to 15, as well as a stamp of my father's signature, some drawing around a photo of some strangers and their old car, a raven, a peacock feather, a page from a dictionary, and a page from an old ledger. I never could figure out how to include the kitchen sink though! Also available in card form. 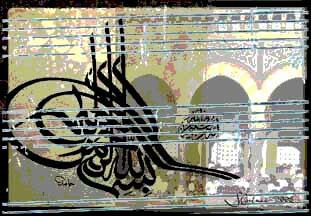 I posterized an image of an Islamic courtyard and overlaid it with a portion of much enlarged music transcription paper. The Arabic calligraphy I used reminds me of a combination and variation of the typical treble and bass clef signs. 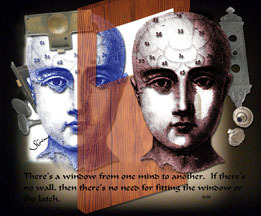 "There's a window from one mind to another. If there's no wall, then there's no need for fitting the window or the latch." I think this gives a whole new meaning to the idea of keeping an open mind. Appreciating the other for their otherness without prejudgment would make the world a more peaceful place to live. "Jews demand signs and Greeks desire wisdom, but we proclaim Christ crucified, a stumbling block to Jews and foolishness to Gentiles." 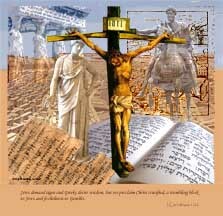 This digital collage surrounds Matthias Grunewald's crucifix with various Greek and Roman sculptures. The background contains Greek and Hebrew script, and an ancient map. Matted, it is ready for a 14"x11" frame.
" 'I can see people, but they look like trees, walking.' Then Jesus laid his hands on his eyes again: and he looked intently and his sight was restored, and he saw everything clearly." This digital collage uses a lot of drawing -- especially in the trees that appear to be men. 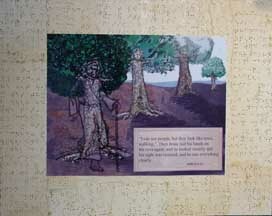 The digital collage includes a mat, as shown here, covered with sections of actual braille pages from the book of Acts.